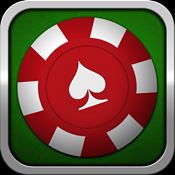 A great new innovative app that allows you to play Texas Hold'em with your friends without the hassle of real cards, chips or even an internet connection and from the comfort of your own iPhone or iPod Touch. In order to enjoy this app, you will need to download the iPad companion which will act as the game table, and then get all of your friends to download this COMPLETELY FREE iPhone app to their devices as well. Then, launch the app, join the game and start playing. It's as simple as that! Each player will have his or her cards in their personal device while the community cards and all of the chips will be displayed on the game board on the iPad for all to see. You can get the thrill of a real Texas Hold'em game with your real friends in real life without the unnecessary hassle of real cards and chips. What are you waiting for? Get it now!